Ali Carter saw off the challenge of World Championship debutant Xiao Guodong to progress to the second round at the Crucible Theatre in Sheffield. The Englishman, runner-up to Ronnie O'Sullivan in 2008 and 2012, recorded a 10-8 win over China's world number 25. Xiao threatened to cause an upset with the match tied at 8-8 but Carter seized the initiative with a break of 80 and held his nerve in the final frame. 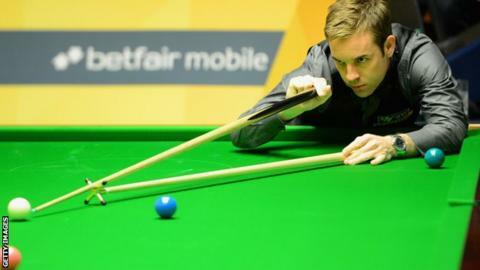 Carter will face compatriot Mark Selby or Wales's Michael White next. "I went out there with a game plan to try and attack and at 4-1 in front I was cruising and felt good," said Carter, 34. "It cost me in the first session as for all the money in the world it looked like I was going to be 7-2 up, but then to get out 5-4 ahead in the end, I felt like I'd had a result. "He played well and didn't look like he was under any pressure at any time. The clearance he made to go to 8-8 was massive - but all credit to me for making the 80 break and playing a granite last frame there to win it." Ryan Day earned a 10-9 win over Scotland's world number nine Stephen Maguire, who fought back from 6-9 down to force a 19th frame. Welshman Day will face Judd Trump or Tom Ford in the last 16. Shaun Murphy,world champion in 2005, overturned a 4-5 deficit at the interval to beat 28-year-old Jamie Cope 10-9 and set up a second-round meeting with Marco Fu or Martin Gould. Earlier, 1997 champion Ken Doherty progressed to the second round for the first time in eight years with a 10-5 victory over sixth seed Stuart Bingham. China's Ding Junhui scored the highest break of the tournament so far with a 136 as he built a 6-3 lead against England's Michael Wasley in a match that resumes at 14:30 BST on Monday.